Liz Wardach is a senior leadership, ethics and organizational sustainability (LEO) major from Scranton, Pennsylvania. Liz attended two Creating Change Conferences during her time at SJU in order to help strengthen the plan for diversification in the SJU community. 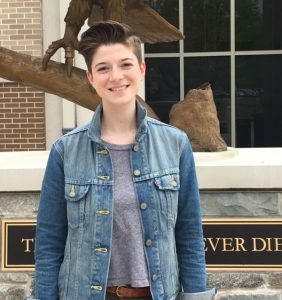 Along with being an advocate for the LGBTQ community, Liz has worked as a writing center tutor and minored in environmental studies and gender studies. After graduation, she will be working as a technical recruiter at Brooksource, a nationwide IT recruitment firm. “I am super excited for the opportunity to work at Brooksource,” she says.